In high performance building design it is helpful, critical even, to start detailed energy modeling for the proposed design as early in the design process as possible. This allows the design team to use this modeling tool to influence the design process resulting in a more cost effective, optimized building design. Pathfinder developed the first energy model for Nuthatch Hollow during Schematic Design. Throughout the next phase, Design Development, the team will continue to update the model and use it to refine our design decisions. One of the goals of the Nuthatch Hollow project is to be a “Net-Positive Energy” design. The project will use renewable energy on site to provide 105% or more of the annual energy that the project uses. Building simulation tools are used to help minimize energy consumption of the design and help achieve the Net-Positive goal. The first step is to enter the building geometry and floorplan into the model. Walls, windows, roofs and floors are entered along with their thermal properties. 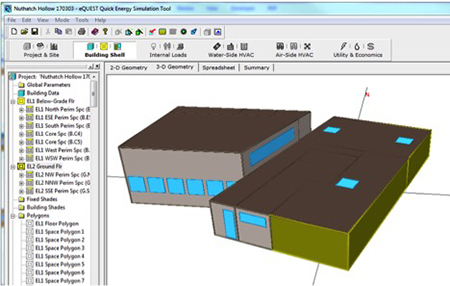 The building geometry is easily viewed and modified in a graphical interface, shown below. Next, building loads are entered, consisting of occupants, equipment, lighting and hot water. The simulation represents one year of operation, so schedules are entered to describe how the loads vary hour-by-hour, as well as daily and monthly, including vacation and holiday periods per the Binghamton University school calendar. For example, a typical Monday schedule for occupancy is shown below. HVAC systems (heating, ventilation and air conditioning) are entered into the model, along with thermostat schedules and the ventilation load (fresh air). Electric HVAC systems will be used to avoid using fossil fuels or other combustion. We are focusing on VRF systems (variable refrigerant flow – similar to heat pump systems). 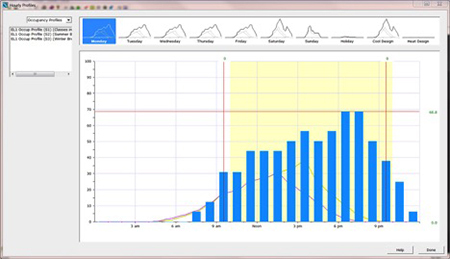 HVAC systems are controlled in the simulation to run only as needed to meet the building loads. The energy model provides detailed information about energy consumption of the proposed design. It is easy for us to make adjustments in the building loads, geometry and thermal properties, and HVAC system efficiency and controls, to see the likely impacts on energy and help us achieve our Net-Positive goal. The JUST program serves as a way to identify socially just and equitable organizations. In February, 2016, Ashley McGraw Architects applied for and received the Living Building Challenge’s JUST Label. 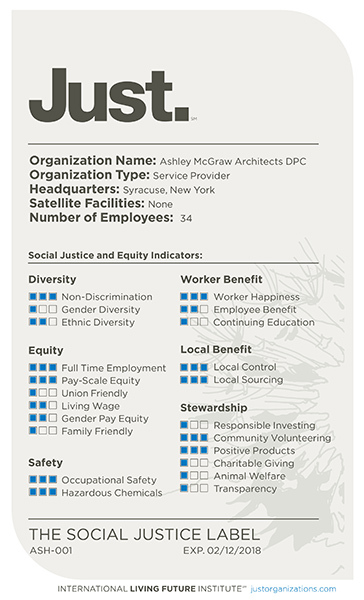 To achieve its JUST label, Ashley McGraw had to report on the following indicators: gender and ethnic diversity; gender pay and pay-scale equity; living wage and full-time employment; occupational safety; employee benefits and worker happiness; local control and sourcing; responsible investing; charitable giving; community volunteering; and transparency. Each indicator metric outlines measurable accountabilities in order for the organization to be recognized at a one-, two-, or three-star level. As the Architect of Record on the Nuthatch Hollow Living Building project, Ashley McGraw’s JUST Label satisfies the requirements of Imperative 18 for the project, while also serving as a barometer against which Ashley McGraw continues to measure its progress in becoming an increasingly socially just and equitable organization. We know the materials in our buildings have a real impact on human health. But how do we find out what is in those materials? And how can we use materials research during the design process to encourage transparency within the materials industry and help transform how building materials are made? Matthew Broderick, Principal of Ashley McGraw Architects, Susanne Angarano, Senior Interior Designer of Ashley McGraw Architects, and Lisa Carey Moore, Healthy Materials Specialist of Integrated Eco Strategy, LLC will share their experiences at the 15th Annual New York State Green Building Conference on Friday, March 31 at the Marriott Syracuse Downtown. Lessons will be drawn from several Living Building projects, including the ongoing design of the Nuthatch Hollow Living Building. They will provide an overview of how the LBC works to advocate for healthy building materials and layout a methodology to develop a materials ethic for a design project and strategies for identifying an initial material palette while incorporating audience participation. The LBC imperative for specifying health materials relative to indoor air quality and the significant deficiencies in policies that regulate the chemicals in the products we use. Explore how the essence of project place can be extracted to help inform the material palette selection, and strengthen the relationship between those healthy materials and LBC design imperatives. Outline how to “vet” a product – an overview of product types, documentation associated with these, and how we answer the question of “is it good enough”. To register or learn more about the New York State Green Building Conference, please visit the conference website.